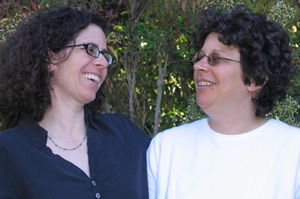 Sisters Inbal and Miki Kashtan spoke together, Monday, on interdependence to launch the BayNVC Telesummit. See below for a free recording. Many spiritual traditions converge with certain aspects of modern science in a basic understanding of life as one interdependent whole. In the natural world, for example, if predators are removed from an ecosystem, the herbivores multiply beyond the available grass and the entire ecosystem is endangered. Our global economy is now recognized to be interdependent as well: if one country falls into an economic crisis, a cascading effect can destabilize the entire global economy. On the human plane, recent developments in neuroscience lead many to conclude that our apparently separate brains are interwoven: others’ responses and expressions affect us in a direct way through mechanisms such as the firing of mirror neurons. These phenomena and so many others are examples of interdependence as a fact of life.At the same time as our awareness of this level of interdependence is growing, our capacity as individuals to engage in behaviors that recognize and engage with our interdependence is diminishing. Interdependence as a practice invites us to consciously engage with ourselves and others in ways that honor and nurture our connection with all of life. We evolved as social beings to live in community, leaning on each other in simple, ordinary ways to meet our most basic needs. Some cultures in the world continue to live in line with this fundamental aspect of our nature. Our modern industrial civilization, on the other hand, continues to encourage and press us to separate from others. As a result, many of us have developed a sense of autonomy that often feels threatened in interactions with others. We have also been taught to aim for self-sufficiency and to disdain any sign of need or vulnerability. Last year, for July 4th, I wrote a blog piece called Redefining Independence, in which I addressed some of these issues from the perspective of what independence can mean: more capacity for choice from within, and a shift from what I see as the illusion of self-sufficiency to the freedom that comes when we can accept our dependence on others for the fulfillment of our needs. Given how deeply entrenched the notion of self-sufficiency is, I feel motivated to elaborate on some of these themes. Many of us are realizing that our very survival as a species depends on our newly appreciating how interdependent we are with our planet and each other. And yet so many of us still have the idea that we can meet our emotional needs from within. I can understand why this idea would be spiritually attractive and deeply empowering. I see that I can lose choice, strength, and flexibility if I have any notion that my happiness, for example, depends on someone else doing something in particular. I am far from confident that the only way to achieve this kind of inner power is to look only to myself for meeting my needs. How can I have a full sense of power while knowing that I depend on others for so many of my human needs? For me, the key to unlocking this paradox is in distinguishing between needing others for meeting my needs, and needing someone in particular. When it comes to material needs, hardly anyone on the planet is self-sufficient, those of us in modern, highly differentiated societies least of all. Who of us grow the food we eat? How many of us are able to provide medical services to ourselves? We generally use money to mediate this dependence on others, and this impersonal relationship certainly makes it clear that we are in need of someone to grow the wheat that goes into our bread, and that it doesn’t usually matter very much who that someone is. More often than not, it is our emotional and social needs that I hear invitations to meet from within. I keep getting the message to look inside for the love, acceptance, acknowledgment, and the like that we are accustomed to look to others for. My heart weeps a little whenever I hear these messages. What I aim for is to embrace my needs and the awareness that in some fundamental way they can only be met by others, while at the same time cultivating the freedom from attachment to the particular forms or people that will attend to my need, or to having the need met at any given moment, or even at all. Yes, we can internalize love and empathy if enough is provided in the critical years in which our fundamental neural and emotional structures are created. Yes, we can rest in our own acceptance and love. And I also know that loving and accepting myself, which I do, is simply not the same human experience as being loved and accepted by others. Even Ishi, the last survivor of repeated massacres of his tribe in California over a hundred years ago, walked into captivity rather than continue to live alone in the wild. I sometimes think of this man, of his agony of being the only one left of his group, what it was like for him. Self-responsibility, as distinct from self-sufficiency, means to me that I recognize myself as the authority on my needs, the one in charge of creating the conditions for meeting them, the one to make all the necessary requests of self and others to fulfill them, and the one who will see to it that I can provide sufficient room for mourning when no strategies for meeting my needs appear feasible. It means not waiting – for others to take care of me without being asked, to love me in the ways I need without being told what they are, to tell me how to fix my life – and instead taking action to make my life what I want it to be. Having shifted my own baseline of operating through my ongoing practice of reclaiming my human vulnerability, I have now come to experience the fundamental interdependence of being human, including my own dependence on others for living my life, as joyous, mysterious, and satisfying. I grow and learn as I make myself available to be affected by others and learn about my own effect on them. I become stronger and more resilient the more I can shed the layers of protection that separate me from asking for what I need. Conscious interdependence as a practice includes in it a commitment to everyone’s well-being. This commitment is a clear and profound antidote to the legacy of separation and scarcity that we have inherited. It is the most surprising principle of Nonviolent Communication for many people I encounter. The idea that in any given situation – be it with co-workers, vendors, children, lovers, or anyone else – we can commit to making things work for everyone comes as a profound revelation to people. When able to take it in fully, they tend to feel energized, liberated, and ready to apply themselves. New options arise spontaneously with which they are eager to experiment.That said, much of the time this idea doesn’t occur to most of us. When presented with this approach, many people experience significant obstacles to its application. One familiar barrier to this aspect of active interdependence is a challenge in seeing others’ humanity, such that the care for their well-being is absent. The other is a real difficulty in caring for ourselves, valuing our own humanity sufficiently to put our needs on the table at all, or strongly enough to withstand the pressures of negotiation without collapsing. This dual challenge is, in itself, a symptom of the move away from community and social living into social separation. In a separated world, I can attend to my needs or to your needs, not to both. In a chosen interdependent world, I can embrace both. Each aspect involves significant work. Trusting that we and our needs matter is no small task when almost all of us have been taught not to want or need anything, to tie our basic human worth with what we could produce, and to minimize the gifts we bring to the world. Similarly, learning to accept everyone’s humanity, even when their actions, thoughts, words, or lifestyle are at odds with ours, requires us to shift from the world of right/wrong thinking into which we have been socialized into the world of caring for everyone’s needs and trusting that strategies could exist to attend to those needs. No small task. And essential for us to be able to restore our capacity to align our actions with our awareness of interdependence. If you are intrigued by this idea of humanizing everyone, you might want to listen to a recording of the first call in this week’s telesummit which continues through Sunday, July 8th, in support of BayNVC. In this call my sister Inbal and I touch on many aspects of interdependence, which is the topic of the entire telesummit. The call includes a practice for how you can transform those “enemy images” within yourself to be ready to care for everyone. This was the first time in three years for us to co-lead, as Inbal has been on extended leave from teaching on account of facing ovarian cancer, so a rare event. You can still register for the telesummit which is itself an interdependent endeavor, supported by a number of dedicated volunteers. If you register you both benefit from learning with 19 different trainers, and have the opportunity to support BayNVC during a difficult transition. This entry was posted in Uncategorized and tagged interdependence on July 4 / 2012 by Miki. Hearing Miki and Inbal on the call was a very sweet, sweet moment for me and my heart melted seeing the photograph you shared. I like having a visual to match the connection I felt during my experience/the call. I have very enjoyed and have learned on the calls so far and really recommend joining the conference! So much truth in this essay to contend with a cultural paradigm that declares every man for himself. Mankind's struggling to gain his own self-interest is really the source the world's miseries. Taking it overly seriously is a disaster. I would love to see someone compose a Declaration of Interdependence to be signed on January 4th, 2013, to be dubbed Interdependence Day. Such an inspiring post. I'm glad to see the second illustration. There is no information about this image in the post, but I believe it is a picture of the performance group Pilobolus.